Deliver food or drinks at the beach for tourists spending the day at the beach. 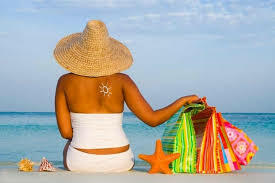 Tourists spending the day at the beach and not willing to leave their stuff unattended or not knowing where to go close to the beach. Charge a percentage fee on top of the shopping price. E.g. 10€ for deposit then the bill + 10% for admin + tip. Start with students roaming around asking people if they want anything. Then create and distribute an app in order to group shopping and save on trips to the shops.